Gears are such an interesting tool. They are used in so many ways and they can be so small but do such big things. I think it is important to help teach our children how these tools work and why they are used. To start instituting this teaching in your children you can buy fun products and toys. By buying toys to peak their interest in this subject they are sure to have fun while learning. To help initiate interest in my children I got them the Gears! Gears! Gears! 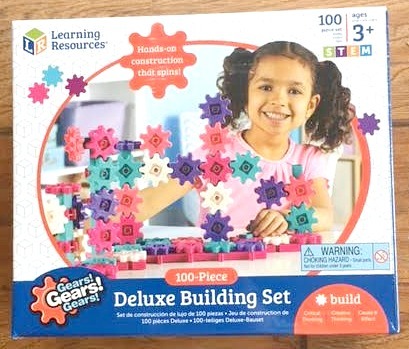 Deluxe Building set from Learning Resources. This set helps them gear into action and learn while having fun! *I got the product listed below in exchange for my honest opinion. The Deluxe Building Set is for children ages 3 and up. You don’t have to be in school to start learning new concepts. With Gears! Gears! Gears! you can start learning more about how a gear works when you are as young as 3 years old! This means it is easy to use and easy to explain. With the Deluxe Building Set you get 100 pieces. 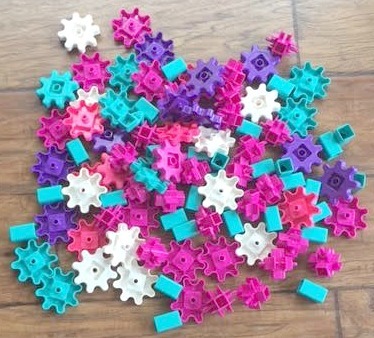 Four of those pieces are the interlocking bases, on the right in the picture above (there are two bases stacked for both). Then there are 96 items that include the gears, connectors and the handle. That is a lot of gears! The gears come in five different colors. The colors are teal, purple, light pink, dark pink and white. The other pieces are the connectors which help hold the gears in place on the bases. 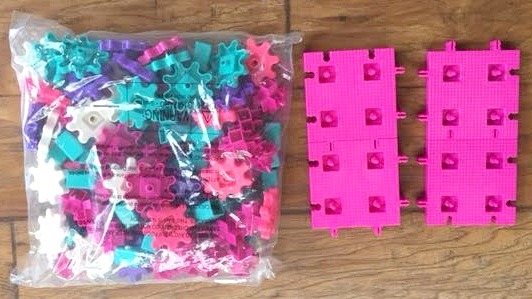 Those pieces are teal and dark pink. The handle is teal. The many colors make the toy fun to look at. It gives the gears an artistic component which adds to the fun and development opportunities. Building the gears was easy and fun. The gears can be built up or can be placed along the top of the bases (which interlock on any of their sides). This diversity of what you are able to do really opens up possibilities of final products. The connectors also make it easy to make bridges and connect two different gear towers. My favorite part of the gear building was connecting two towers from one side of the base to the other. 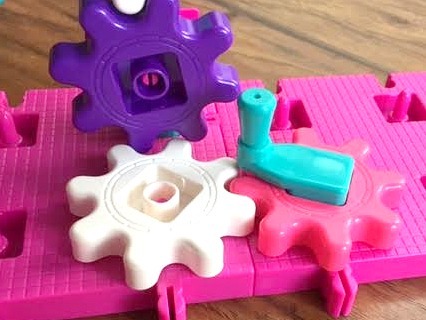 This was done by connecting gears along the top side of the base. The final step of building is to insert the handle. The handle is easy to put in and really you could put it in almost any gear, as long as no gears are in it’s way. It was really fun and fulfilling to watch what I had just built be put into action. Each gear turned from one side to the other. This could definitely provide hours of educational fun for any child, even for some adults! 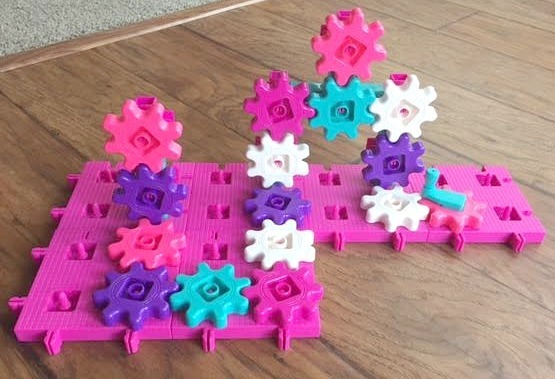 Would your child love to learn more about how gears work? What would their favorite part of the Deluxe Building Set be? Let us know in the comments!